This is just to tell you guys that I’ll be taking a break from simming for a little bit to focus on the rest of this semester. I’ll be studying and attempting to nail down my thesis topic, so I should really focus. The Mayfields will continue to be updated, as I have quite a few chapters in reserve now (our next family head is adorable). 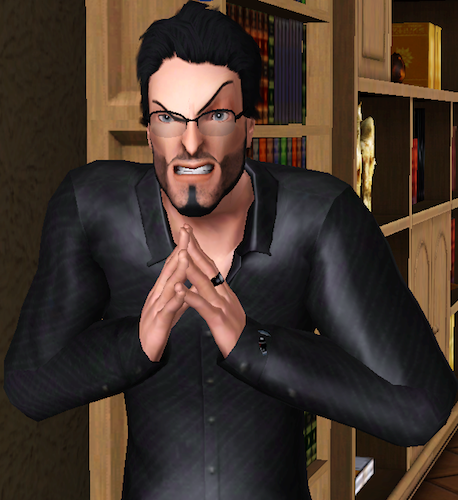 However, I’m all caught up to in game for the Diabolicals, so you’ll have to wait for them. I’m not saying I’ll drop off the face of the earth, just that if I do post, it’ll be sporadic at best and non-existent at worst until the holidays. I am sorry. I was really getting into playing and writing the Diabolicals. But I guess, we’ll all have to wait to see what Goodie Snow and Magno Volt look like as children. Speaking of the newest Diabolicals, check out the awesome genetic diversity of generation 3! Three different skin tones, two different noses, two different mouths, three different hair colors (Magno Volt actually has very dark brown hair, not black – I think its from Hans) and two different eye shapes! All to create three very different toddlers! 8D I love genetic diversity. Not gonna lie, though, if we could keep these narrow, Diabolical eyes in the family for another generation, I’ll be so happy. Also, these kids all now have their own pages over in the Diabolical Who’s Who guide. And the Score has been updated as well, to reflect more portraits painted and the new generation. Woo! It’s alive! Yes, I know, it’s hard to believe. But here we are! There’s so many chapters back THAT way that I wish you good luck in catching up. I’ll leave you alone for a few days, then we’ll meet back here to talk about heir polls. Good? Good. Alrighty. So, I’ve been gone a while. Partly due to my laptop. The hard drive died about a month ago, and I’m still wrangling with customer service to get it replaced. It’s getting close to me just throwing my warranty out the window and replacing the thing myself! And, I’ll be honest, partly because…I found more interesting things to do. Before my hard drive gave out, I was playing Undertale and Stardew Valley and my Mayfields, all of which were more interesting than the Diabolicals at the time. So, there’s that. Sorry for the lack of update or explanation. Most of you who read this also read the Mayfields, so I usually just put updates over there and assume everyone gets it. As soon as I fix up my laptop, it’ll be back to weekly updates, I swear! That’s not an empty promise! I was so close to reaching Gen 2 in game! Mori was nearing teenager-age and the girls were celebrating becoming YAs. I guess this is to say: hang in there, the Diabolicals WILL return! Anyway, enough of my bawling. This was just to let you goes know where I’ve vanished to and about when I’ll be back. My first day of freedom should be Halloween. So maybe I’ll do something special. So, as you may have noticed, I’ve been doing a bit of editing to the blog layout. If you didn’t notice, take a good long look at the title of this post. I really like this theme, Suits, but I miss the nice red post titles of the Museum theme*. Can’t have everything, I suppose. Meh. A new thing I’m trying out is having a Head of the Family picture off in the sidebar. It’ll probably have a link to the Family page hidden in it or something. *waves hand vaguely* You can thank LilyShadowWriter of the Different Winters blog for giving me the idea (cough *completely stole it! * hack-cough). This was just a kind of an update post and a request for reader opinions. If you dislike this theme, or just really preferred the previously used theme, or have different suggestions, say so in the comments. The next chapter should be up in a bit. I’m just having problems finding a certain picture and that picture is absolutely, 100% ESSENTIAL! No, really, it is!